To understand Pakistan’s collective masochism, one needs to study the drastic social and cultural transformations that have made this country so utterly different from what it was in earlier times. For three decades, deep tectonic forces have been silently tearing Pakistan away from the Indian subcontinent and driving it towards the Arabian peninsula. This continental drift is not physical but cultural, driven by a belief that Pakistan must exchange its South Asian identity for an Arab-Muslim one. Grain by grain, the desert sands of Saudi Arabia are replacing the rich soil that had nurtured a rich Muslim culture in India for a thousand years. This culture produced Mughal architecture, the Taj Mahal, the poetry of Asadullah Ghalib, and much more. Now a stern, unyielding version of Islam – Wahabism – is replacing the kinder, gentler Islam of the sufis and saints who had walked on this land for hundreds of years. This change is by design. Twenty-five years ago, under the approving gaze of Ronald Reagan’s America, the Pakistani state pushed Islam on to its people. Prayers in government departments were deemed compulsory, floggings were carried out publicly, punishments were meted out to those who did not fast in Ramadan, selection for university academic posts required that the candidate demonstrate knowledge of Islamic teachings, and jehad was declared essential for every Muslim. One can squarely place the genesis of religious militancy in Pakistan to the Soviet invasion of Afghanistan in 1979 and the subsequent efforts of the U.S.-Pakistan-Saudi grand alliance to create and support the Great Global Jehad of the 20th century. A toxic mix of imperial might, religious fundamentalism, and local interests ultimately defeated the Soviets. But the network of Islamic militant organisations did not disappear after it achieved success. By now the Pakistani Army establishment had realised the power of jehad as an instrument of foreign policy, and so the network grew from strength to strength. The commonly expressed view is that Islamic radicalism is a problem only in FATA and that madrassas are the only jehad factories around. This could not be more wrong. Extremism is breeding at a ferocious rate in public and private schools within Pakistan’s towns and cities. Left unchallenged, this kind of education will produce a generation incapable of living together with any except strictly their own kind. Pakistan’s education system demands that Islam be understood as a complete code of life, and creates in the mind of the schoolchild a sense of siege and constant embattlement by stressing that Islam is under threat everywhere. Fearful of taking on powerful religious forces, every incumbent government refused to take a position on the curriculum and thus quietly allowed young minds to be moulded by fanatics. What might happen a generation later has always been a secondary matter for a government challenged on so many sides. 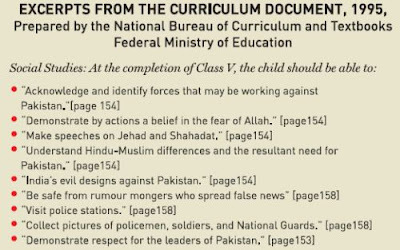 The promotion of militarism in Pakistan’s so-called “secular” public schools, colleges and universities had a profound effect upon young minds. Militant jehad became part of the culture on college and university campuses. Armed groups flourished, invited students for jehad in Kashmir and Afghanistan, set up offices throughout the country, collected funds at Friday prayers, and declared a war without borders. Pre-9/11, my university was ablaze with posters inviting students to participate in the Kashmir jehad. After 2001, this slipped below the surface. The primary vehicle for Saudi-ising Pakistan’s education has been the madrassa. In earlier times, these had turned out the occasional Islamic scholar, using a curriculum that essentially dates from the 11th century with only minor subsequent revisions. But their principal function had been to produce imams and muezzins for mosques, and those who eked out an existence as “moulvi sahibs” teaching children to read the Quran. The Afghan jehad changed everything. During the war against the Soviet occupation of Afghanistan, madrassas provided the U.S.-Saudi-Pakistani alliance the cannon fodder needed for fighting a holy war. The Americans and the Saudis, helped by a more-than-willing General Zia, funded new madrassas across the length and breadth of Pakistan. A detailed picture of the current situation is not available. But, according to the national education census, which the Ministry of Education released in 2006, Punjab has 5,459 madrassas followed by the North West Frontier Province (NWFP) with 2,843; Sindh 1,935; Federally Administrated Northern Areas (FANA) 1,193; Balochistan 769; Azad Jammu and Kashmir (AJK) 586; FATA 135; and Islamabad capital territory 77. The Ministry estimates that 1.5 million students are getting religious education in the 13,000 madrassas. These figures could be quite off the mark. Commonly quoted figures range between 18,000 and 22,000 madrassas. The number of students could be correspondingly larger. The free room, board and supplies to students, form a key part of their appeal. But the desire of parents across the country is for children to be “disciplined” and to be given a thorough Islamic education. This is also a major contributing factor. Madrassas have deeply impacted upon the urban environment. For example, until a few years ago, Islamabad was a quiet, orderly, modern city different from all others in Pakistan. Still earlier, it had been largely the abode of Pakistan’s hyper-elite and foreign diplomats. But the rapid transformation of its demography brought with it hundreds of mosques with multi-barrelled audio-cannons mounted on minarets, as well as scores of madrassas illegally constructed in what used to be public parks and green areas. Now, tens of thousands of their students with little prayer caps dutifully chant the Quran all day. In the evenings they swarm around the city, making bare-faced women increasingly nervous. On the plus-side, they are not blowing up schools - yet. Read the Hoodbhoy article here. I'm not sure what to say. I read this whole post, and will download and read the essay these excerpts are from, too. Hoodbhoy's line:"Left unchallenged, this kind of education will produce a generation incapable of living together with any except strictly their own kind" is especially frightening to me-- he's talking about a closed society. I might not agree with philosopher Karl Popper on a lot of things, but an Open Society (and the critics it entails) seems really essential for involvement with the scientific and global community. I hope Pakistan isn't cutting itself off from all of that. "..(see Mohsin Hamid, Mohammad Hanif, Kamila Shamsie, Daniyal Mueenuddin, etc.). 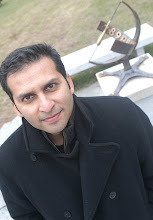 One thing in common: they all grew up in Pakistan in the 1980s and their stories often revolve around that time." too deserves a mention here - especially since her novel is so relevant to the ethos/theme of this blog. "The paleantologist Zahoor is trying to do his research while General Zia is launching a campaign to Islamize knowledge. Science is being rewritten and called Islamic Science. The teaching of evolution is banned. Nothing is natural or accidental; everything is ‘revealed’ and ‘ordained.’ On a fossil dig in the Salt Range of the Punjab, an area that once lay beneath the Tethys Sea, Zahoor’s granddaughter, Amal, finds proof of the ‘dog-whale’. No one knows it yet but she has found Pakicetus, the oldest known primitive whale." yup - my fault for the omission. I was planning a post to combine the whale story with her novel. Will do soon. But thanks for pointing her out here.